Here in the Lowcountry one of the most common fish that we catch is the black sea bass. These fish don’t get very big…on average about 12-16 inches in length, but for what they lack in size they make up for in numbers and appetite! On top of that they are one of the best eating fish that you will find anywhere. In many cases we will find the sea bass on nearshore and offshore structure such as live bottom, hard bottom and wreck sites. Once we get into em you better get ready for some NON-STOP action. These fish are so aggressive that it is not uncommon to catch well over a hundred fish per person on an outing…now thats a lot of catching! Though there are a number of ways to catch sea bass I generally like to fish for them my means of jigging the bottom with light to medium action spinning rods. Moreover, while jigging for sea bass we commonly catch other species such as bull redfish, red snapper, grouper and jacks. 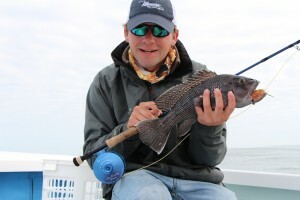 Fly fishing for black sea bass? Yes I said fly fishing…a little while back while offshore fishing with a fly fishing buddy of mine we were jigging for sea bass and for every bass that we brought up from the bottom there were another 4-5 fish following. This is not that uncommon, but the light bulb went off for both of us and we were both fighting to get to the fly rod for some sea bass action. Since then I have honed my techniques for catching these fish on both the surface and the bottom using the fly rod and the rewards have been great. We have been able to regularly catch sea bass on the fly until we were flat wore out! If you are looking for some nonstop fishing action then black sea bass fishing might be for you.